It is with sadness that we acknowledge the passing of Kathleen (Katie) Baxter. 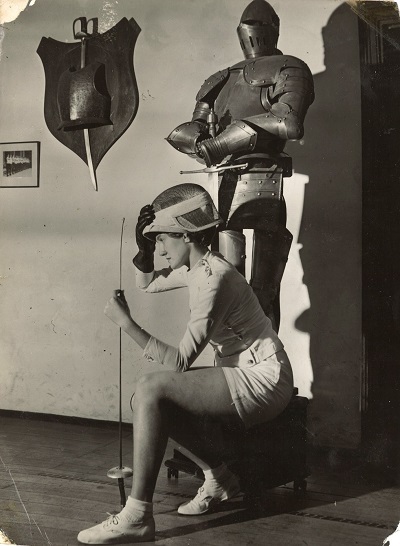 Katie began her fencing career at The Swords Club in 1949 and went on to compete at the Rome Olympics in 1960. Katie initially made the switch from tennis to fencing as wet weather had interfered with her playing so she decided to try an indoor sport. She took lessons from Owen Weingott before moving to Professor Joan Beck. In 1951, she competed in her first National Championships in Brisbane. She was a reserve team member for the Australian Team in the 1958 British Empire and Commonwealth Games in Cardiff, Wales. By 1959 she had won the NSW State Open Women’s Foil and National Women’s Open Foil titles which saw her inclusion in the Australian Fencing Team for the 1960 Olympic Games in Rome. Like other Fencing Team members she was required to raise seven hundred and forty—nine pounds to secure her team place. TSC members rallied around Katie and other fellow club members, including Brian McCowage and David McKenzie to assist in raising the necessary funds. During the Olympics she won two bouts but it was not sufficient for her to promote to the next round. However the wonderful experience of her first Olympics stayed with her for the rest of her life. Employment with American Express enabled Katie to travel to many countries to fence and train. She continued to compete in State and National competitions up until 1967 and fenced on a casual basis through to 1979. Katie was a sectional manager for the tragedy-marred Munich Olympic Games and held roles as Secretary and Delegate for New South Wales Fencing and The Swords Club. Katie was held in high esteem in the Australian Fencing community and will always be remembered with great fondness. Her funeral will be held in Bowral on Wednesday 3 April. Further details will be advised in due course. Source: Edited extract: SLNSW. Swords Club scrapbooks and memorabilia, 1913-2014, Compiled by Professor Joan Beck and Janet Hopner Haswell.